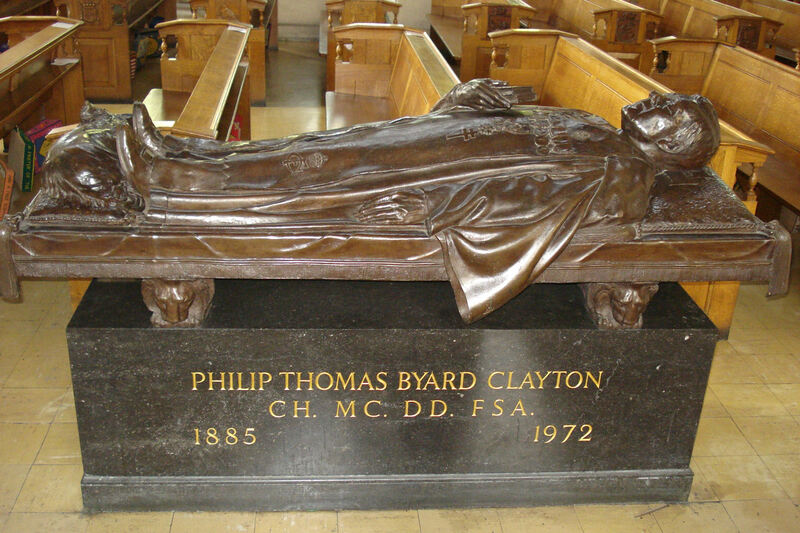 The effigy of the Rev'd Philip Thomas Byard Clayton (popularly known as 'Tubby') is one of the last works by Cecil Thomas, the ‘soldier sculptor’, who also made the Forster Memorial in the south aisle of the church. Tubby's dog sits on a tasselled cushion at his feet and the effigy is supported by four lion cubs, one at each corner. Tubby was the founder Padre of Toc H. Assisted by fellow army chaplain Neville Talbot, he established Talbot House ('Toc H' in signaller's jargon), a unique rest house in Poperinge for serving soldiers near the fierce battleground of Ypres in Flanders during the First World War. Tubby became Vicar of All Hallows in 1922 and remained here for forty years, until his retirement in 1962.